Shimla : Union Minister J P Nadda demanded that Himachal Pradesh Chief Minister Virbhadra Singh resigned over corruption charges against him and questioned the "silence" of top Congress leadership on the issue. 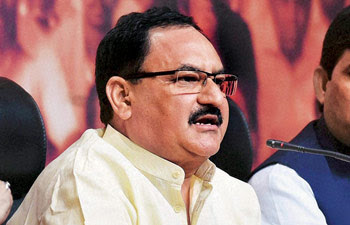 Nadda further questioned the "silence" of Congress president Sonia Gandhi and vice president Rahul Gandhi on the issue. Central investigating agencies appear to be in no mood to turn down the heat on Himachal Pradesh Chief Minister Virbhadra Singh. Nearly two months after the CBI raided 11 addresses linked to the former Union minister in a disproportionate assets case, the Enforcement Directorate, on 20 November, conducted searches against him at nearly a dozen other places across three states. The ED carried out these searches in Delhi, Mumbai and Kolkata, as part of its money-laundering probe against Singh. The agency had filed the case under the Prevention of Money Laundering Act (PMLA), after taking cognisance of the criminal complaint filed by the CBI in September. While Singh responded to the searches without getting defensive, more such action by central agencies cannot be ruled out. Tweeting about the incident, Singh appeared to be taunting the Union government, asking it to get the FBI or Scotland Yard to investigate if it wanted to, but put an end to this police-thief game soon. He also wondered aloud whether the fresh searches were because of BJP's frustration after losing the Bihar assembly polls. There is speculation, however, in the corridors of power that Singh may be arrested soon by the CBI.Singh has a long history of corruption allegations. The present case is against him and his family members for allegedly amassing Rs 6.1 crore beyond the known sources of their income during Singh's tenure as Union Minister of Steel, from 2009 to 2011. Common Cause, an NGO, had filed a PIL against him in the Delhi High Court in November 2013, seeking a court-supervised probe by the CBI or the Director General, Income Tax (Investigations), against him. Common Cause has alleged there are several other instances of corruption against him. What is unique about Singh's case is the prompt action taken by central agencies, even as several other cases are languishing.Singh has become a rare sitting CM to face CBI and ED action, while his Madhya Pradesh and Rajasthan counterparts, Shivraj Singh Chouhan and Vasundhara Raje, have been luckier. Over four months have elapsed since the Supreme Court handed over cases related to the Vyapam scam in the MP to the CBI, but the agency is yet to make any headway. Meanwhile, opposition parties have made several allegations against Raje as well, over her alleged links with former IPL chairman Lalit Modi. The ED has issued notices against Modi, who is in the UK, but is yet to show similar promptness in getting him back. Neither has the Union government ordered the agency to probe the allegations against Raje.The case against Singh has given rise to all sorts of speculation. There are reports about factionalism between several Congress leaders in Himachal Pradesh. In the meantime, there are several rumours in Delhi's power corridors too. Speculation is rife that Finance Minister Arun Jaitley's offensive against Singh, may end up indirectly benefiting senior Congress leader from the state and Deputy Leader of Opposition in the Rajya Sabha, Anand Sharma. Sharma, reports claim, may be eying the CM's chair. That a BJP government should help Sharma with his ambition seems incredulous. Sharma has little grassroots support in the state, having never been a part of many electoral battles. However, he has been a Parliamentarian throughout, having been elected to the Rajya Sabha in 1984. His closeness with the party's central leadership is a well-known fact. On the other hand, if reports about Singh not sharing a similar relationship with the party's top leaders are true, that could spell trouble for him.In that case, if the central agencies unearth evidence that strengthens the case against the CM, he is unlikely to get the required backing from the party high-command in Delhi. The coming few weeks will be crucial for him.